MIAMI – January 18, 2019 – Telemundo announced the premiere date for “Betty en NY” on Wednesday, February 6 at 9pm/8c. A Telemundo Global Studios production, the family-friendly dramedy also stars Elyfer Torres alongside Erick Elías, Sabrina Seara and Aaron Díaz with a special participation from César Bono, Saúl Lizaso, Héctor Suárez Gomís, Alma Delfina and Jeimy Osorio. 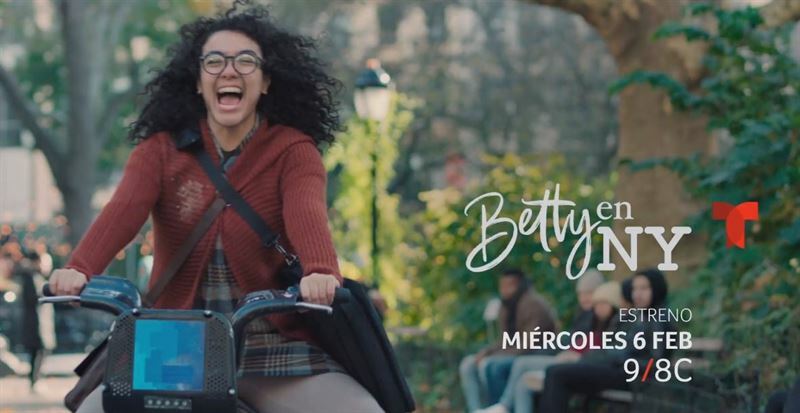 One of the most influential stories in global broadcast history, Telemundo’s “Betty en NY” reimagines "Yo Soy Betty, la fea" for a new generation of viewers. The series chronicles the life of Beatriz Aurora Rincon Lozano (Torres), an intelligent and skilled young Latina living her dream in the Big Apple. After six months of being rejected for multiple jobs due to her lack of attractiveness, Betty makes the fateful decision to accept a position below her qualifications. Landing a job at stylish V&M Fashion, she becomes the secretary to the company's president. Often ridiculed and humiliated for not fitting in, Betty is determined to stand model-tall in this war of appearances. It may be the fashion business, but Betty has designs on how to grow as a person. Still, none of her degrees may help her with the biggest challenge of all: true love. “Betty en NY,” the first scripted production filmed at Telemundo Center, also includes the participation of Sylvia Sáenz, Mauricio Garza, Sheyla Tadeo, Isabel Moreno, Amaranta Ruiz, Valeria Vera, Daniela Tapia, Mauricio Henao, Gloria Peralta, Pepe Suárez, Verónica Schneider, Rodolfo Salas, Freddy Flórez, Candela Márquez, Jaime Aymerich, Polo Monárrez, Rykardo Hernández, Paloma Márquez and Jimmie Bernal, among others. Viewers can follow the production on Facebook https://www.facebook.com/bettyenny/, Instagram @BettyenNY and Twitter @BettyEnNewYork, and join the conversation using #BettyenNY on all of these platforms. For more information, please visit nbcumv.com and connect with TLMD on Facebook and Twitter, or visit us at telemundo.com and YouTube.